Playing with Toys: Fedora Linux on the GPD Pocket [Final Update: 1/15/2017] | Photo Restorations by Tim G.
I bought a new netbook computer a couple weeks ago, and it’s the cutest thing you ever did see. It’s called the GPD Pocket, and it is a full Windows 10 laptop about the size of a 7-inch tablet. The specs are impressive for the devices size: quad core processor, 8GB RAM, 128GB solid state hard drive, and as the name implies, it will literally fit in the pocket of one’s cargo shorts. The first run of these machines was offered as a perk for supporting the GPD team’s Indegogo campaign. This experimental run has naturally come with bugs for some backers, but in exchange for this risk the early adopters received their Pockets for about $100 the final retail price of $497.17. Those backers who have experienced bugs are now receiving some support through the comments section of the Indegogo campaign. The GPD team will use the bug reports and feedback provided by the early adopters to polish off and make ready the units now being offered at retail through AliExpress.com. If you are a genealogist on the go, like me, I think you’ll find this quite the handy little machine. I’m definitely bringing this one out with me on my next genealogy bike tour of Lancaster County, Pennsylvania. Heck. I might take it all the way to Pittsburgh! The GPD team originally offered the Pocket in both Windows and Ubuntu Linux versions. Since I’m such a Linux nerd, I naturally requested the Ubuntu Linux version of the pocket. The Ubuntu firmware, however, has been held up in development for the past couple weeks, so the GPD team began shipping Windows versions of the Pocket to some of their Linux backers, with instruction to install the Ubuntu firmware when it becomes available. I have received the Windows 10 version of the Pocket, and I’m pleased to announce of the hardware that everything is in good working order, and I’m completely charmed by the device. Although the Ubuntu version of the machine is still not ready for production, I can confidently recommend buying the Windows 10 version based on my experience, and for the beginning Linux enthusiasts out there, I would recommend awaiting the announcement from the GPD team that the Ubuntu firmware is ready before purchasing your Ubuntu pre-installed version of the Pocket. Of course, I never wait for anyone’s permission to go ahead and install Linux on a new computer, and I’ve made no exception for the Pocket. I’ve been tinkering with Fedora on the Pocket for the last couple weeks now, and my system is now just about ready for regular use. My genealogy followers can probably tune out the remainder of this post. Linux geeks: This one’s for you! UPDATE, 7/17/2017: Now testing Linux Kernel 4.13-rc1! Read more below. Linux on GPD Pocket is still in the experimental stages. 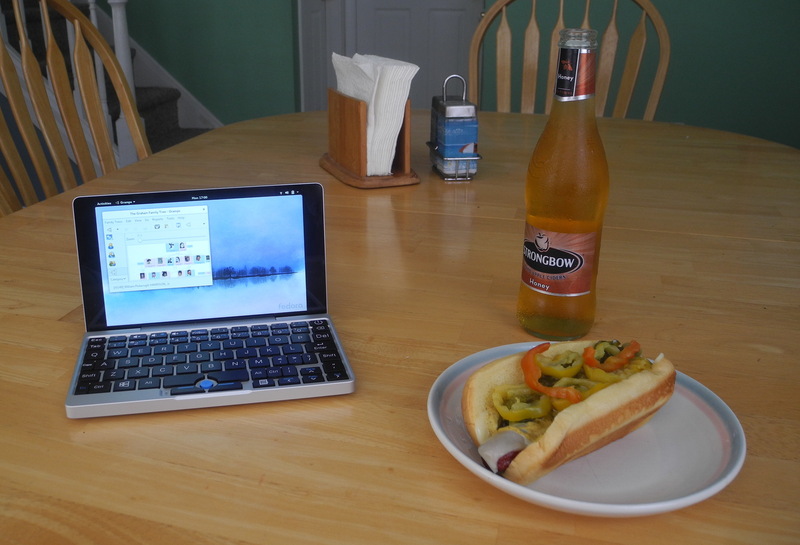 In general, the device is simply too new and innovative for Linux to work out-of-the-box yet. Linux developers love nothing more than a good challenge, however, and they have wasted no time whipping up alpha and beta level software tweaks to get the Linux operating system usable on the Pocket. I reckon it won’t be long at all before these changes are accepted into the mainline Linux distributions. I’m more of a Linux end user and beta tester than a developer. Most of what I’ll write here has been slightly adapted from the work of other brilliant Linux enthusiasts, notably a fellow named Hans de Goede, whom I have neither met nor heard of a week ago, but whose name now seems as familiar as that of a friend, and the gaggle of fellow enthusiasts on the Linux on GPD Pocket reddit topic. That thread is mostly geared toward installing Ubuntu, but at least one other user, Daniël van Eeden, is also working through Fedora. Daniël is savvier than I am, so I imagine I’ll be mostly just testing his innovations. With the GPD team working overtime on Ubuntu firmware, and the Linux on GPD Pocket team wrangling with Ubuntu, why am I instead working on Fedora? The answer is simply that in all my years on Linux, I have never used Fedora before. Every time I try a new Linux distro, I learn a few more things about the operating system, and I wanted to continue that pattern with this new machine. Before I even received this machine, I had an idea that I wanted to use Fedora on it, so that’s what I have done, and I’m sticking with it! First Step: Preparing your devices. So you’ve ordered an Ubuntu-preinstalled GPD Pocket, but received a Windows 10 Pocket instead. What to do now? The first thing to do is prepare your Pocket’s internal drive with enough space to install Fedora. 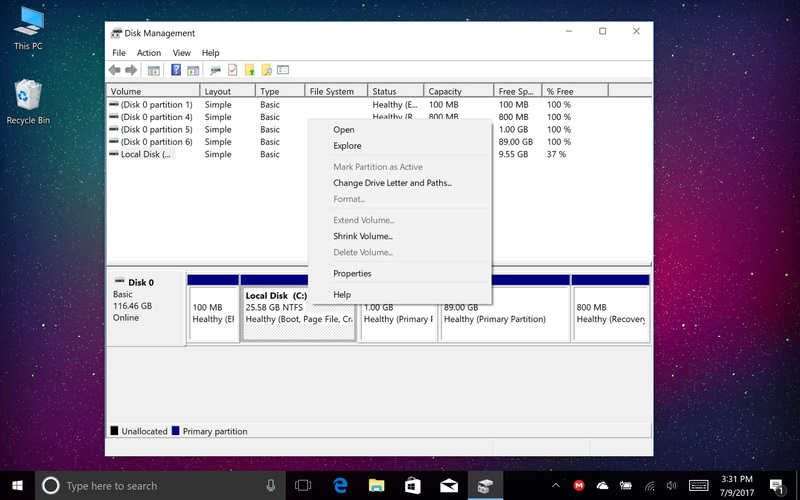 Tap on the Windows key, type Partitions, and press Enter to launch the Windows partition manager. There are a couple small partitions for such tasks as booting and recovery. I left these alone because they are quite small. I wouldn’t gain much from removing them. I resized only the C:\ portion of the drive by right clicking it and selecting Shrink Volume from the menu. I reduced the C:\ drive by 90 Gigabytes, leaving about 28 Gigabytes for Windows. Of course, you are welcome to set your own proportions, and you’ll have to do some arithmetic to get it right. Close the partition manager when you are done. Windows Disk Management, after Fedora has been installed, with a 1GB boot partition and an 89GB logical volume dedicated to Fedora. Next you will need to create a bootable Fedora installation USB drive. Since the Pocket is so cutting edge, I would recommend eventually installing Fedora 26 beta, but there may be some problems with WiFi if you install that version directly. I’ve already had success installing Fedora 25 and then upgrading to 26, so that’s the method I’ll describe. The Fedora website provides a USB installer app for Windows in the form of a downloadable executable (.exe file). Double-clicking this executable will install the app to the Pocket. Launching the app will then guide you through the process of creating a bootable Fedora installation medium on your USB drive. As of this writing, Fedora 25 is the current officially supported version, with Fedora 26 due to be released in a few short days. If clicking Fedora Workstation invites you to install version 25, go ahead and do that. If clicking Fedora Workstation invites you to install version 26, then I would recommend instead downloading the Fedora 25 image from this location, and then clicking Custom image to create your Fedora boot medium. Again, the purpose of favoring Fedora 25 at this stage of installation is that the 4.11 kernel that ships with Fedora 26 contains a bug that prevents one from enabling WiFi on the Pocket. The 4.8 kernel that ships with Fedora 25 does not have the bug. Fedora Media Writer, showing the creation of USB installation medium from a custom image. You will need a USB drive larger than 1.3GB to create the bootable USB. That should not be a challenge to procure. Also, if you are a smartypants and you have your own favored method of creating bootable USB drives, be advised that the Pocket has a UEFI boot system, so do whatever you need to do to get that running. The Fedora Windows Installer seems to take care of it automatically, so I would recommend using that. After the Fedora Windows Installed has completed its process, leave the USB in the drive and go through the normal Windows reboot procedure. As you see the GPD logo appear on the screen, press on the DEL key a few times to enter the Pocket’s BIOS. From BIOS, you can instruct the Pocket to boot from you USB installation medium. Once you see the BIOS screen, however, you’ll immediately understand one of the challenges of configuring Linux on the Pocket. You see, it looks like the GPD team took a regular 7-inch tablet touchscreen, turned it sideways, and stuck it on a netbook chassis. The default orientation for this hardware is in the portrait mode, so we have some work ahead of us to turn everything into the landscape mode. In the meantime, during the installation process, just turn your head sideways a little bit to get through this stage of the installation. Use the right and down arrow keys to navigate to the Boot Order section of the BIOS, and use + and – to change their order until UEFI USB … is at the top of the list. (You might also recognize the manufacturer of your USB drive on the same line. Mine is a PNY.) Once this is set, use Fn+F4 to save, exit, and continue with the boot procedure. As the machine continues to boot, you’ll notice a few sideways Linux status messages, and then the screen will go black. This screen blackening is another one of the tribulations of installing Linux on the Pocket at this early stage, but a permanent fix is in the works, and we will be installing it. The temporary fix for now is to close the laptop screen when it turns black, wait some seconds, and then open it again. Get used to that motion. You’ll be doing it a lot until we enjoy the pleasure of installing a custom 4.12 Linux kernel that fixes the issue. After you close and open the laptop screen as necessary, you should notice some more sideways Linux status messages, and then ultimately boot into the sideways Live Fedora installation environment. Once there, you can rotate the display 90 degrees to the right by tapping on the Windows key and typing Displays. The GNOME Displays Manager has the option to rotate the display. Once applied, though, you’ll encounter the screen of blackness once again. Open and close the clamshell as necessary to re-establish visuals—but do it quickly. You’ll have about 6 seconds to accept let the desktop environment know that you’re accepting the newly rotated setting. Use the Pocket’s mouse button to click on the selection; the touchscreen input is not yet calibrated! Now that you’re in a properly rotated installation environment, you may install Fedora to your system’s hard drive using the Anaconda installation wizard. You may access this wizard by pressing the Windows key and clicking the installation icon at left. Using the wizard is straightfoward enough, but I would like to direct your attention to a couple settings that might improve your Fedora experience down the road. The wizard will direct you to set the destination drive to which your Fedora operating system will be installed. While making that choice, take note of the option to manually configure partitions. Tedious as this is to do, you’ll want to do it. Choose “I will configure partitioning” to manually configure your Fedora partitions. Choose “I will configure partitioning” to manually partition your Fedora installation. You will next confront the Manual Partitioning dialogue. In the pink box at lower left, you should notice the amount of free space you allocated to your Fedora installation in the previous steps. (My space free space is tiny because I’ve already gone through the full installation process. There is hardly any space left on the device!) After noticing that, the first thing you will want to do is automatically create the mount points by clicking right where it says to click. Take note of partitioning scheme and fedora-root partition size when configuring your partitions. I reduced my root partition size to 12 GB. Next, you might like to choose your partitioning scheme. The default is set to LVM, with which I personally am most unfamiliar. I read up on it a little bit, and was impressed with the possibilities. The LVM stands for Logical Volume Management, and under this scheme one can do all kinds of tricks, like join together multiple drives to have your operating system read them together as a single drive. I would like to learn more about this technology, but my impression is that this scheme goes a bit overboard for the Pocket’s humble 128GB SSD. The main trouble I’ve had with using LVM is that the partition editors with which I have become familiar, such as Parted, GParted, and GNOME Disks, can not edit or resize logical volumes. The Blivet-gui software seems to be able to do it, though I haven’t yet tried. Besides that, the command-line LVM tools seem to be the primary way to edit or resize logical volumes. I stuck with LVM for my partitioning scheme because I like a challenge, but for a more simpler and more familiar partitioning scheme, you might like to change that to the Standard Partitions scheme. One thing you’ll definitely want to change, though, while in the Manual Partitioning dialogue, is the size of the root partition (or logical volume, if you’re going that route). By default, the Anaconda installation tool sets the size of Fedora’s root partition to a whopping 50GB, apparently irrespective of how little space you may have allocated to your Fedora installation. In my case, I allocated 90GB to Fedora. With 50GB having gone to the root partition by default, and fewer than 40GB remaining for data in my home partition, I soon found myself running out of disk space and unable to store all of my genealogy files on the Pocket! To avoid this tragedy, I advise drastically shrinking Fedora’s root partition, and then growing its home partition by the same amount. The amount you choose to shrink it will depend on how you intend to use Linux on your Pocket. If you see yourself using many various software applications, you might like a slightly larger root partition on which to install the applications. 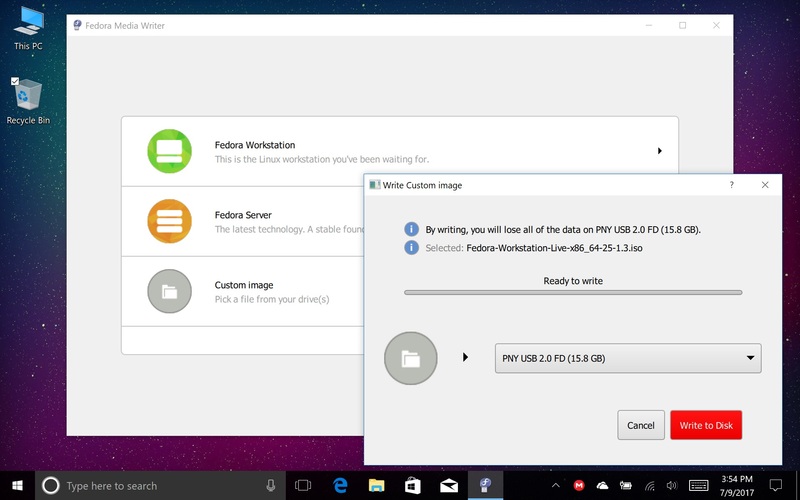 If you are like me, and you have a large amount of data but intend only to use a few programs, you might get away with a smaller root partition that leaves more room for data on your home partition. If you read up the forums for what a good root partition size might be, you’ll see recommendations ranging from 10GB to 30GB. I personally settled on 12GB, thereby allocating and addtional 38GB to my home partition, which I found to be plenty of space to accommodate my genealogy documents. After you resize your root and home partitions, go ahead and click Done to proceed with the installation of the operating system. You may notice while doing so that you computer has failed to connect to WiFi. No need to worry about that now. Fedora will install, all the same. In the last steps of the installation, be sure to create a user and a super-user password. When installation completes, shut the pocket down, remove your installation media, and restart into your new Fedora installation! You will notice, of course, you will need to open and close the screen a bunch of times again while booting and rotating the screen. That’s not such a big deal and will be fixed shortly. The Pocket will not connect to WiFi out of the box on Linux. It will find available networks and prompt the user for a password, but then it will go no further, and the connection will not occur. If you have successfully installed Fedora 25, you can enable WiFi by following the instructions offered by Mr. Hans de Goede at his blog. The trick is to copy this file, brcmfmac4356-pcie.txt, into your /lib/firmware/brcm folder and restart the machine. That’s it. It worked for me on Fedora 25, which uses kernel 4.8, but won’t work on Fedora 26, which uses kernel 4.11. Be sure you’re using the right kernel. to make the transfer. Don’t restart the machine quite yet, though. There is one more small chore we can do before we restart. as recommended. This line will correctly rotate the post-GRUB menu boot screen, although at least the intel_pstate option seems to be optional. After adding the line, save the file and close the editor. Now restart the Pocket. You should be able to log in and connect to a WiFi network. You should hear your fan whir to a start, and the fan should start on subsequent boots. Any files automatically downloaded to the Downloads folder during this process can be deleted. The upgrade will take some time, after which you may then upgrade the system to Fedora 26. The last command will cause your computer to reboot. The scheduled upgrade will then occur during the reboot process. When your computer reboots, however, you may find that the prior update has placed some new Linux 4.11 kernels in the GRUB menu. Avoid them. Remember to select the 4.8 kernel; this is the only kernel under which WiFi will still work. This custom 4.12.0 kernel will provide improved bootup and shutdown, more consistent screen performance (no more black screen), debugged WiFi, and a battery monitor. Hans has provided some instruction for installing his kernel over at his blog, but I’ve found the need for a couple minor tweaks on the Fedora system. This will open a text editor where you can make the necessary change to the config. Use Ctrl-F to find the line CONFIG_HDMI_LPE_AUDIO=m. Comment that line out by typing a hash (#) and a space in front of it, as you see it has been done a few lines above. Use Ctrl-S to save the file, and then close the editor. You will be prompted to confirm that you do not want to install the HDMI audio without HDaudio on Intel Atom platforms module, which we have just removed from .config. Type N to confirm that you do not want it. I suspect that this module is important for HDMI audio output, which I have not yet had occasion to test. It’s not a deal breaker for me, because I don’t see myself ever using HDMI audio output for what I do, but others will surely want it. In distributions past, I’ve always been required to follow this step with an installation command such as grub2-install /dev/sda. Apparently this is unnecessary on UEFI systems like the Pocket, so don’t even bother! Just go ahead and reboot the system. using either sudo reboot, or the GNOME Desktop’s shutdown controls. The shutdown process is still quite unclean at this point, which is one of the problems the 4.12 kernel is intended to remedy. The screen will be black for a while. Feel free to kill it after a while by holding down the power button. I did. Then reboot. Congratulations! You should now have clean boot process, replete with sideways Fedora splash, and a slick new battery monitor. Cool! First, copy this file, 99-touchscreen-rotate.conf, into the folder /etc/X11/xorg.conf.d. Then, either re-start the Pocket or log out of your user. When you return to your (still sideways) login screen, click your username. Before typing your password, click the settings gear and choose Gnome Xorg from the sessions menu. Then type your password to start a Gnome Xorg session. A GUI application call dconf-editor can also help you change the setting. If the touchscreen orientation was not correct before, it should be correct now, and with that—the CPU fan enabled and a properly oriented touchscreen—your pocket should be mostly ready to begin everyday use! An application called GDM supplies Fedora’s login screen, and unfortunately it does not abide by the same rules and the main desktop session. Some further tweaks are necessary to rotate that correctly. By my count, line 122 of this file controls the scaling. Use Ctrl-F to find the line with the search term name=”scaling-factor”, and then change the number between the <default> tags to 2. Save the file and exit the editor. Your login screen should now be properly rotated, however, touch input on the login screen has not yet been rotated to match the visuals. Unfortunately, I have not yet found a solution to this sticky problem, but since I don’t see myself touching around a whole lot on the login screen, this is not a deal breaker for me. $ sudo grub2-set-default "Fedora (4.12.0-rc7+) 26 (Workstation Edition)"
You should no longer need to use the arrow keys to manually select the 4.12 kernel. Note however that this fix does nothing to rotate the GRUB menu. I believe that problem has yet to be solved. Since this applies the proper driver to the currently running kernel, it will surely need to be reissued after each kernel update. Not a big deal. When I did this for myself, I got some ominous looking warnings about certain things being missing, but ultimately the method seemed to work. I now have Bluetooth enabled. Reddit user Stockmind, over at the Linux on GPD Pocket thread, had an alternative method for enabling Bluetooth, which was to copy this file, 99-local-bluetooth.rules, to the folder /etc/udev/rules.d. I personally had greater success with Daniël’s method, but some users will surely find Stockmind’s method helpful. My Bluetooth mouse now works, but unfortunately I have not yet achieved sound over my Bluetooth headphones. This seems more like a sound configuration bug than a Bluetooth bug, since the headphones do seem to connect. Since the space is so limited on the dual-booted GPD Pocket, I won’t be able to transfer all of my music to it. I therefore intend to make greater use of the music I have stored on Google Play. To that end, I found installing Adobe Flash to be necessary. This might be accomplished by installing and running the Google Chrome browser, which comes with Flash pre-packaged. For the past five years, this was the only true option for using Adobe Flash on Linux without engaging in undue hacks that I never seemed to be able to pull off. Last fall, however, Adobe issued the version 26 of the Flash player, which is the first version to officially support Linux since version 11.2 was released in 2012. Since I’m trying not to install too many extra large applications on my limited root partition, I’ve chosen to stick with Fedora’s native applications, including the Firefox browser, as much as possible. Using Google Play on Firefox entails installing Flash player via Adobe’s web site. This will not only install the current version of Flash Player, it will also install updates as they become available, along with your other system updates. Now we’re getting to the fine details. This is a matter of preference, but I have found many websites to load just a little too large under Firefox, thereby not fitting within the screen, horizontally. Firefox does not seem to have a default zoom setting, so I added this functionality through the Zoom Page add-on. Once installed, the Default Zoom (%) option is under the Zoom Levels tab in the Zoom Page Options dialogue. I set it to 90. I also went with the Minimal Layout button style under the General tab to preserve precious toolbar real estate. Then set the animated background through Gnome Settings clicking the down arrow in the upper right, clicking the settings icon, and clicking Backgrounds. 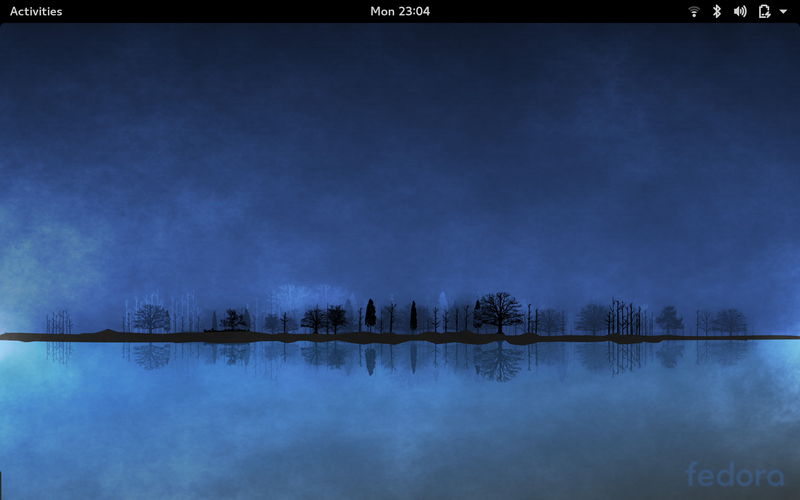 Choose the new version of the background, with the little clock in the corner, then be amazed at how the virtual sun rises and sets over your new dual-boot Windows/Fedora GPD Pocket! Of course, be sure to change both the desktop background and the lock screen background. The animated Fedora 26 background, during the overnight hours. One side effect of changing the default background is the loss of the Fedora logo at bottom right. Surely, you will want that back to show it off to all of your friends. To get the logo back, press the Windows key and type Tweak Tool. The GNOME shell will invite you to install the said Tweak Tool, which offers a few extra settings to tweak your desktop. Once installed, launch the Tweak Tool and, under Extensions, find the Background Logo extension and click the gear to edit its settings. You may find that the window gets cut off at the bottom. Hold down the Windows key and drag the window up to reveal one more hidden setting: The “Show for all backgrounds” check box. Check that box to restore the Fedora logo, and make it a little bigger while you’re at it. You’ll want all your friends to see it! This animated background is such a tough act to follow, I’m not quite sure what I’m going to do when Fedora 27 beta comes out with a new background. How will the Fedora team top this? After all the adjustments mentioned above, I’m quite pleased and satisfied to say that I have a GPD Pocket that runs Linux well enough for me to do all the tasks I need it to—and support will only improve in the coming months. I can’t hardly wait to take it with me on my next multi-day genealogy cycling adventure! USB-C data connection: Linux apparently doesn’t support this yet at all in any stable distributions, but there is apparently active development in this area. Future versions of the Linux kernel will support it. Sound over Bluetooth headphones: Gotta be a sound card issue. Rotate the GRUB boot menu: I don’t know if anyone on Reddit has gotten the GRUB menu rotated yet. I haven’t tried. Rotate the splash screen: Since day one, the Redditors have recommended disabling splash. I never did that. I like the splash, but I’d also like to see it rotated correctly. I haven’t yet tried to rotate it. Rotate touch input at the login screen: I use it so infrequently, I might forget it’s a problem before I ever solve it. HDMI output: I have not tested this at all. I suspect HDMI sound output will be lacking so long as the snd_hdmi_lpe_audio module is disabled, but I really don’t know. I haven’t tested it. I don’t even have the right cable for it. The GPD Pocket, running Fedora 26 beta and GRAMPS. Fan service seems to work, even with gpdfand (installed above) disabled. Bluetooth service seems to work, even with rc-local (installed above) disabled. Login screen touch input is now rotated correctly. When the splash screen works, it is still not rotated correctly. When it doesn’t work, the splash screen often goes black. We seem to have reverted at times to the old behavior of needing to open and close the clam shell computer screen to re-awaken it at the now-correctly-rotated login screen. It doesn’t happen all the time. I wonder what the pattern is? The module snd_hdmi_lpe_audio still breaks the sound and still must be removed from the kernel .config file. USB-C Data still doesn’t seem to work, despite there being some kernel modules enabled to that end. This is the deal beaker: Kernel 4.13-rc1 is awfully crashy. About a third of the time, it crashes on login. The rest of the time, it’s bound to crash sometime while I’m surfing the web. Sounds bad, but hey: They don’t call it unstable for nothin’! Besides this stuff, I do have one more observation to make. I haven’t tested this under Windows, but under Fedora Linux the charging of the device is definitely a little janky. When the unit is on while plugged in, it doesn’t get a very good charge. If the unit is busy, say compiling a kernel, the battery charge actually goes down while the unit is plugged in. Oddly, I don’t think I’ve ever had it shut down on me while compiling a kernel. When the kernel is done compiling, thought, I might find the battery charge down to about 3%, especially if the battery was already low when I started the process. The Pocket will not boot if the battery is too low, whether it is plugged in or not. If the battery runs down too low, you’ve got to charge it for a while before it will boot again. A phone-like battery screen (rotated incorrectly, of course) will indicate the charge instead, and the boot process won’t proceed beyond that screen until the charge gets up into the double digits or so. The surest way to charge the device, at least when booting exclusively into Linux, is to turn the unit off completely and let it charge that way either overnight or while I’m away at work. When I return to the unit after that, the charge is always back up to a reliable 100%. After that, the battery life is quite comfortable, in my opinion. Some folks on the Indiegogo campaign web site have complained that they are disappointed in the battery life, or at least that it was not as long as advertised. The battery usually seems to get me though the evening, so I usually don’t run into any battery life problems before turning in for the night. I just have to remember to turn my unit all the way off if I want it to be reliably charged in the morning. Again, I haven’t tested this under Windows, but when running Linux exclusively it seems to be the case. UPDATE 12/4/2017: I ran into a pretty serious problem with my system this week, caused by an attempted system cleanup. After an upgrade, the “sudo dnf autoremove” can remove obsolete packages from your system. I would normally recommend executing this command after an upgrade, but last week this got me into a bit of trouble. You see, for some reason, the autoremove command now deletes the grub2-efi package and its dependencies. Apparently, your UEFI system needs this package to secure boot non-standard kernels. When autoremove removes the grub2-efi package, the system will no longer secure boot. It will instead ask you to find an MOK, or Machine Owner Key somewhere on your system. Either the system I built above has no such key, or I don’t know where to find it. The way I understand it, Fedora’s stock kernels come with all the signatures and keys needed to satisfy the UEFI secure boot system. When we start building our own kernels, as I did above, the UEFI secure boot system is not longer satisfied with with the state of the signatures and keys, and it refuses to boot until such signatures or keys are provided. If you haven’t got any keys, you might be out of luck. I’m not sure exactly which of these grub2-related packages is the cause of the problem, but these are the packages I restored after autoremove removed them. You’ll find that some of these are dependent on others, but that’s the list of packages I replaced. Only after replacing those packages should you reboot your Pocket and make sure everything is in order. (If it isn’t in order, I don’t know what to tell you, but this did work for me!) Now that the grub2-related packages have been manually installed, you should be able to run autoremove in the future without fear of having these important packages removed. In fact, give it a try after reboot. DNF should report back that there is nothing left to remove! Disable “Secure Boot” in BIOS: Apparently this is a thing, but I’ve got no idea how to do it on the Pocket. Generate MOK keys and sign your binaries when you compile your custom kernels. If that sounded like it made no sense, it’s because I’ve got no idea what I’m talking about. Further information on both of these methods is on this page, through I haven’t myself gone through the processes well enough for them to bear fruit. Keep in mind, also, that if perfected, these methods have the potential of actually fixing the problem, if you happened to encounter the problem without having prepared beforehand. Disabling “Secure Boot”, if possible, should fix the problem immediately. Generating MOK keys, etc., could work, if done from a chroot environment. I tried it once without success, but I now believe that I did not rightly get all the way through the instructions on the page. You’ll need a USB boot drive. The one you made above to install Fedora in the first place will work great, but basically any half decent linux distro on a bootable USB that can get you to a terminal will do. On top of that, you’ll probably need a second USB drive on which to store your data. (The Fedora USB made above will not have formatted additional space for your data unless you went through some extra steps.) Lastly, you’ll need a USB hub so you can plug both drives into the pocket at once. Plug your hub into the Pocket’s USB slot, and then plug your bootable USB into one of the slots on the hub. Power up the Pocket and enter BIOS so that you can boot from the USB as described above. Rotate the screen and all that jazz, and then get to a terminal. If you are using the Fedora installation medium, just hit the windows key and type “Terminal” in the GNOME shell. Plug in your second USB drive—the one you are using to recover your data. You are now ready to type some commands. to edit your hard disk. Type p at the prompt to print a list of your hard drive’s partitions. From there, type d to begin deleting partitions. You will be prompted for the number of the partition you want to delete. You can delete all your Linux partitions to make room for the reinstallation. (NOTE: If you are dual-booting Linux and Windows, be VERY CAREFUL not to delete either your Windows partition or your Windows EFI boot partition. If you mess up and accidentally delete your Windows partition(s), GPD did send out a Windows firmware image that may be helpful to reinstall Windows. I haven’t tried it yet, so I can’t vouch for it, or the process of using it. If you have any doubts you would do well to back up all of your Windows data as well before deleting your Linux partitions.) After you have used d to delete your partitions, type w and press enter to make your changes permanent and quit fdisk. You may now restart your system and reinstall Fedora as above.